There’s something about a view of the water that makes life better. We travel all over the world because we enjoy waking up to a view of waves, some choppy, others calm, but always some shade of blue. Some of the most popular cities in the world enjoy a bay view, but none quite like San Diego’s. This sunny SoCal destination may be a military town, but all that might comes complete with a shine that resonates on and off the water. The San Diego waterfront has a number of easily recognizable landmarks. 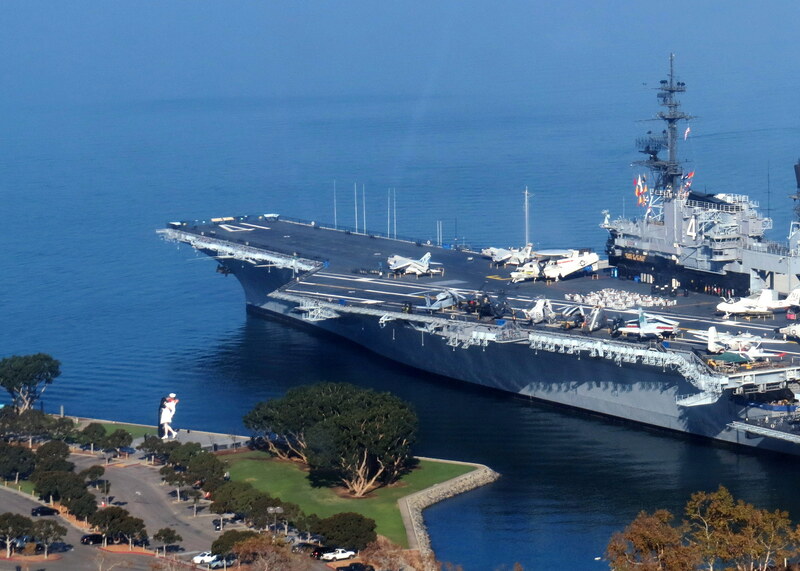 Truth be told, the sheer size of the USS Midway aircraft carrier and the Coronado Bridge make both next to impossible to miss. But an argument could be made for yet another landmark that stands watch along the water. As the tallest waterfront hotel on the west coast, the Manchester Grand Hyatt has earned its reputation as an urban luxury resort and spa. These three words can make or break a vacation. When it comes to real estate, the Manchester Grand Hyatt has a primo location. On the edge of downtown San Diego, the International Airport is only a ten minute drive away. Seaport Village is steps outside the backdoor, the Gaslamp Quarter and Little Italy make for a nice walk on a sunny day. That is, if you decide to leave the hotel. The Manchester Grand Hyatt is what I consider a huge hotel. After all, it’s not an easy feat becoming the tallest waterfront hotel on the west coast. With an amazing 1,628 rooms, it wouldn’t be hard to imagine guests getting lost, but an attentive staff does a great job making the hotel feel small. Sure, I had to learn which elevator would deliver me to my room, but the clear, concise welcome I received at check-in had me off in running in all of the right directions. Be prepared to drop everything, except your camera, when you unlock your door. The inspiration of a multi-million dollar renovation will be crystal clear. 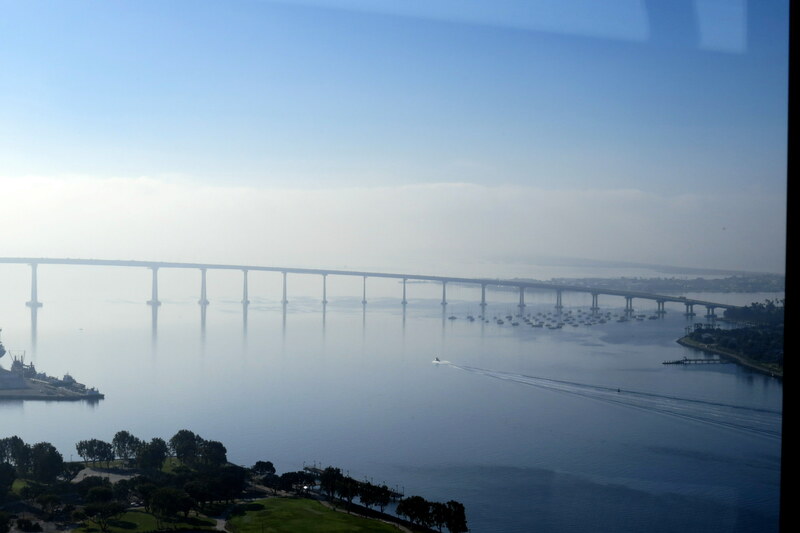 All rooms feature floor-to-ceiling windows that showcase views of the San Diego Bay and downtown. Kudos to the folks who realized the Hotel’s neighbors offer better views than any artwork hung on a wall ever could. Just when you think the panoramic views can’t get any better, it’ll hit you – the windows open – letting all that fresh sea air in. Note the plural. 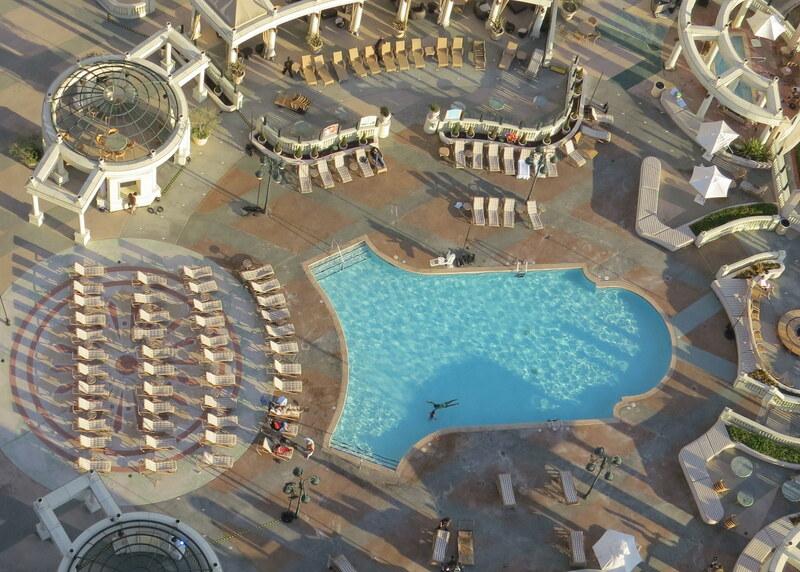 The Main Pool is located on the hotel’s 4th floor. Grab a chair or rent a cabana. During the summer, kids ditch their parents and head to the Pool’s Back Yard to play games like football, ping pong and giant-sized checkers. Camp Hyatt offers summer fun for kids ages 3 through 12. For folks traveling without kids, or parents who just need some time away, Kin Oasis delivers. 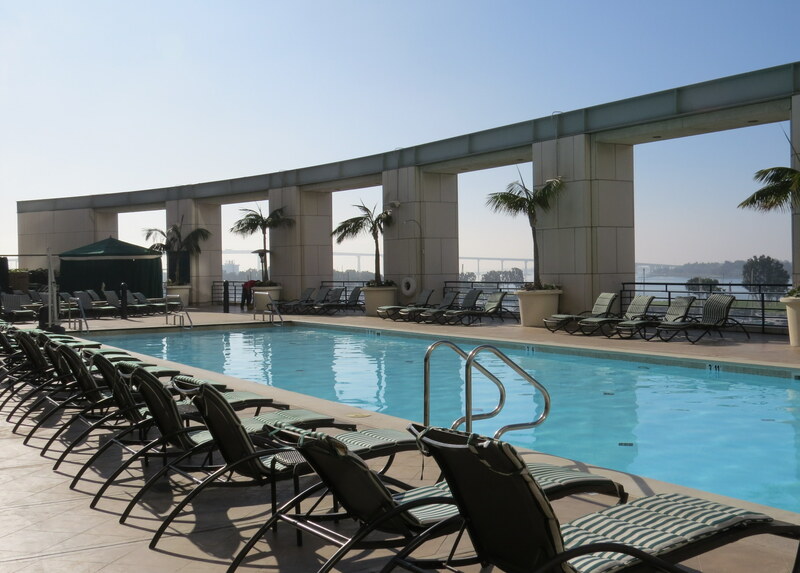 This adults-only pool is located on the 3rd floor overlooking San Diego Bay. If you really want to feel pampered, poolside Kin Spa is just steps away. There’s a wide range of choices to spoil yourself; massages, manicures, pedicures, facials and body wraps. Whether you’re looking for an excuse to dress up or a quick, casual bite to eat, there’s something for just about every craving. The seasonal Pool Bar & Grill means not having to put on shoes. Redfield’s Deli is perfect if you’re on-the-go. Sally’s Seafood on the Water gives you, as you might have guessed, great water views, seafood, steaks and a number of gluten free choices. Fuel up for a busy day of lounging by the pool with breakfast at Lael’s Restaurant. 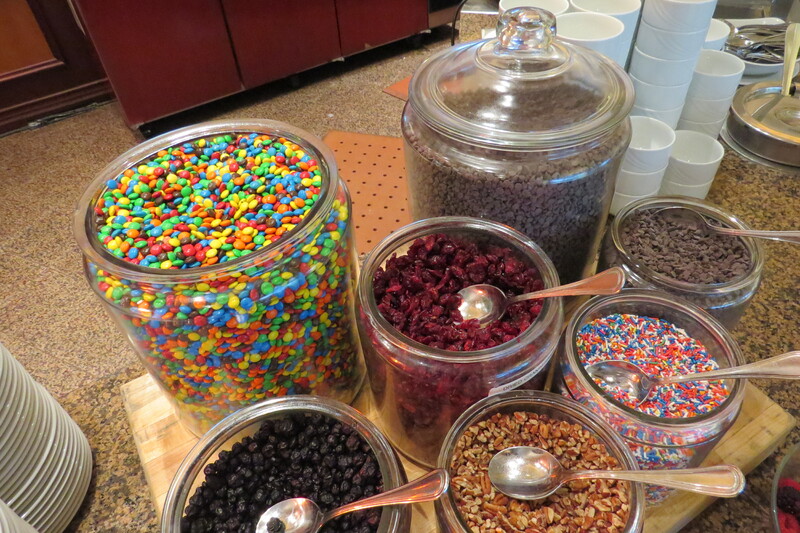 This diet-busting buffet is worth splurging on at least once during your stay. It’s got everything you’d expect from a hotel buffet – made to order omelets, bagels, fruit and a never ending supply of bacon. But it also has sweet surprises. The day I indulged, I enjoyed honeydew juice instead of the basic orange. And though the plate after plate of Danishes, muffins, croissants and other fresh baked pastries were tempting, I held out for the waffle bar, which includes one of the biggest jars of chocolate chips I’ve ever seen. S’mores aren’t just for camping anymore. Be sure to pick up a s’mores kit from the Pool Kiosk or Redfield’s Deli in the lobby. Fire pits light up the night on the 4th floor pool deck. I like to think vacation calories don’t count, but if you’re determined to maintain those workouts, the Manchester Grand Hyatt makes it easy and actually pretty fun. 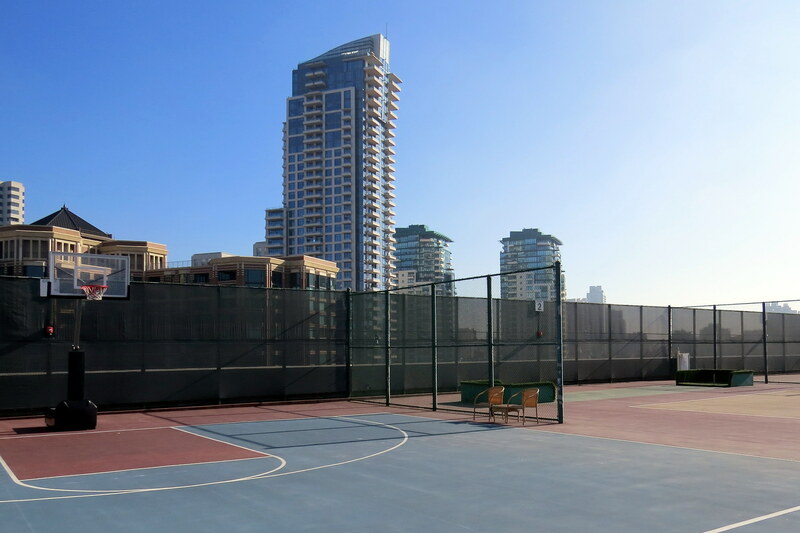 The 24 hour Hyatt Stay Fit Gym has views worth bragging about and keeping fit is taken to new heights on the Roof-Top Sport Courts. There’s tennis, volleyball, shuffleboard, basketball and horse shoes to inspire you to keep moving. Runners who want to get out and about will love the detailed neighborhood running maps.If they’re not careful, it might be the only time they leave the hotel. Time flies when you’re feeling spoiled. To read the Luxe Beat Magazine version of this article click on the title San Diego Sea Air Bliss.